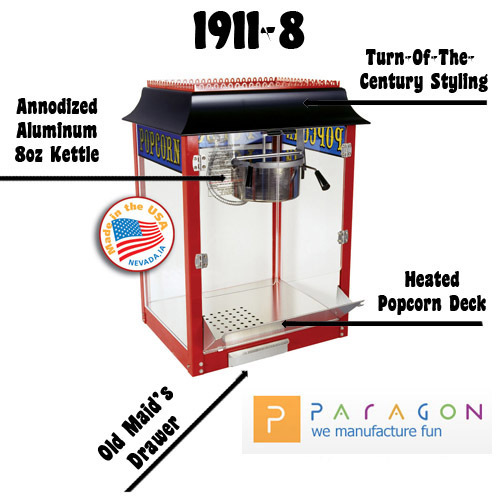 Paragon's 1911-8 popcorn machine features an anodized aluminum 8-oz. 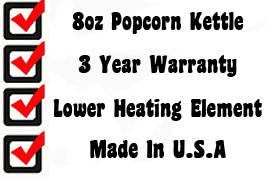 popcorn kettle. Bright red paint and black canopy roof, and popcorn graphics for that Turn-Of-The-Century style. Tempered glass sides, plexi-glass pair of doors, lower cal-rod heating element, old maid's tray for catching unpopped popcorn. 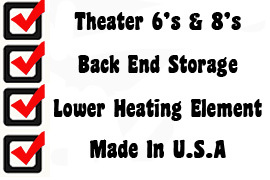 Whether the ORIGINAL 1911 BRAND 8-ounce popper ends up in a bar, hotel, cafeteria, retail store, bank or dealership, you will be assured of producing theater quality popcorn with turn-of-the-century nostalgia. Complete with Paragon's exclusive three year warranty. 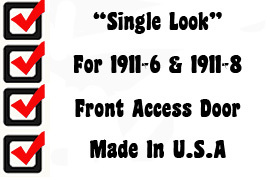 Perfect for the 1911-6 & 1911-8 popcorn machines. Make popcorn machine appear as a "Single" unit.